Just as the moon controls the tides, there are significant forces at play when it comes to holding on to your staff. 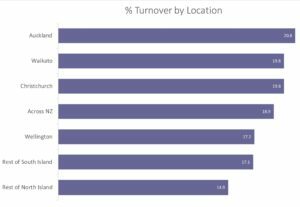 Traditionally the strength of the economy has been the largest force affecting New Zealand staff turnover. It remains significant and it is still an undeniable fact, when the economy is up so is staff turnover. Two other factors have rapidly climbed to challenge the economy in its impact. Firstly, the rapid change to the composition of our workforce. For example, Millennial’s (those born between 1981 and 1996) currently account for 34 per cent of New Zealand’s labour force and by 2020 will be the majority. 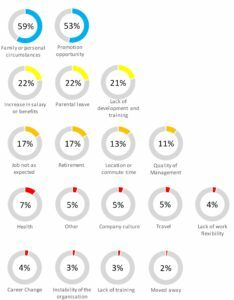 The Deloitte Millennial survey in 2018 found that 43% of Millennial’s plan to leave their company within two years, a time period less than what most New Zealand employers would consider appropriate. Secondly, Technology has made it easier for people to instantly find and apply for new job opportunities. The smart phone and recruitment platforms such as LinkedIn are having huge impact on the mobility of your staff. We expect AI to bring a leap in capability in this area, the result being your staff instead of looking for jobs will be more easily found and have many more relevant job opportunities presented to them. 1. Measure your staff turnover and compare to other companies in your industry or sector. If your Voluntary turnover is higher than your competitors, it is a fact your business will be less competitive. If it is better than your competitors, you must be doing something right so find out what it is and build on it. 2. Be proactive, identify your key talent and determine their motivators. Develop a range of retention strategies, regardless of the size of your company. The Lawson Williams National Staff Turnover Survey is supported by HRINZ and is in its 11th year. It provides a measure of staff turnover and has once again produced some interesting findings that assists participating companies to better understand the performance of their recruitment, on-boarding and retention processes. The survey also reports on the use of the 90-day trial period. This year for the first time we also look at the reasons for Voluntary turnover and the retention strategies being employed by New Zealand companies. The average national turnover figure is calculated using the levels of Voluntary and Involuntary turnover. The average New Zealand staff turnover rate in 2017 was steady at 18.8% and remains the highest since 2008. 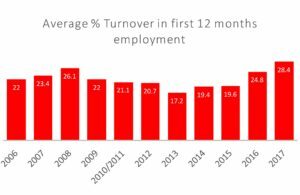 We have not returned to the levels of total staff turnover pre-GFC which reached 23% in 2007, however the ratio of Involuntary to Voluntary turnover is at its lowest in 10 years and in fact Involuntary turnover is at its lowest point since the beginning of this survey in 2006. If Involuntary turnover is at its lowest point in 11 years, why aren’t we seeing Voluntary levels of turnover like we did in 2007? Despite the changing demographics of our workforce and the increasing effectiveness of technology for finding work, inflation and its direct impact on wage inflation has significantly impaired the levels of Voluntary turnover in the current market. People are more inclined to leave jobs for higher salaries and these higher salaries have not been on offer. Inflation has remained at the levels of the 90’s where it averaged around 2.4%. Wage inflation is directly proportional to CPI inflation and consequently we have seen little movement in salaries over the years following the GFC. In 2017, the labour cost index which is a measure of annual wage inflation climbed by 1.9 per cent, however if the aged-care worker settlement was excluded, the index would have risen by just 1.6 per cent. In comparison the labour cost index reached 3.9% in 2007. 2018, is obviously signalling a change to low salary inflation. The 2017 change in government and subsequent activity around wages will result in a climb in the labour cost index. How this impacts more broadly across the public and private sectors remains to be seen with any resulting change in Voluntary turnover a subject of future surveys. We would also suggest that the high level of migration into New Zealand has impacted Voluntary turnover. The volume of immigrants seeking work in New Zealand has created significant competition in the local job market. Due to the skills shortage across many disciplines and often with the increased level of skills brought by these immigrants, local employees are often finding it more difficult to secure new employment. Failure of hires in the first year has reached its highest level in eleven years. 28.4% of all hires in New Zealand don’t last beyond 12 months. This is an 14.5% increase on the previous year and the highest since to beginning of this survey. 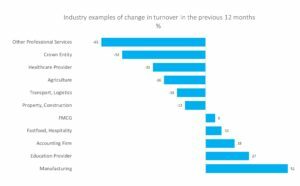 When we consider specific industry or sector results (these figures are provided in the full survey report provided to survey participants) we know that turnover in the first 12 months varies significantly. 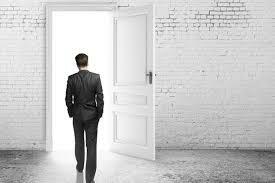 However, any turnover in the first 12 months should be seen as a failure of recruitment and on boarding. From 25 years of experience in recruitment, Lawson Williams believes that turnover within the first 6 months of employment is typically a failure of the recruitment process and on boarding. After 6 months the honey moon period of a new job has typically worn off and staff turnover is more impacted by the lack of or misdirected retention strategies. Our research shows that dissatisfaction with management will more often surface at this point and becomes a significant factor in staff turnover between 6 to 12 months. The National Staff Turnover Survey provides turnover data for a range of industry sectors. 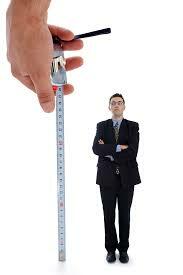 The real value in Staff turnover measurement is to compare your company turnover against your competitors. 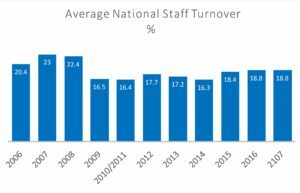 Staff Turnover percentages can vary significantly from year to year as shown in the following sample table. Why do people leave their job? We asked organisations what the reasons for their Voluntary turnover were in 2017. 74 percent of our respondents reported having a formalised exit interview process, indicating that a significant number of New Zealand employers are making proactive efforts to identify the cause of staff turnover and tackle any problem areas. We asked organisations to identify the top three reasons for voluntary turnover. 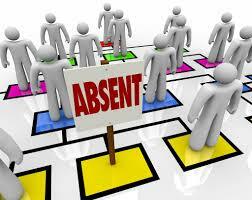 Family/personal circumstances was the biggest contributing factor for staff departures. Many organisations also identified promotion opportunities elsewhere, an increase in salary, parental leave or lack of existing development/promotion opportunities as a key reason. If you are interested in more information on Staff Turnover in New Zealand a detailed summary report is available at www.lawsonwilliams.co.nz.